More and more, we’ve seen retailers falling into the trap of using markdowns and discounts as a pricing strategy. This strategy was on full display over the 2016 holiday season. “Median discounts across top retailers during Thanksgiving weekend increased by 5 percentage points to 16 percentage points over 2015,” according to Boomerang Commerce, a provider of retail pricing technology. Big-box retailers like Target and Walmart appear to be leading the charge in this markdown mania. Boomerang reported that Target’s median discount for products listed on the first page of their Black Friday deals page rose an additional 27% from last year to 43%, and Walmart’s average discount on promoted items rose from 28% to 33% – a whopping 17%! What’s driving this? Amazon certainly plays a role. On November 26, 2016, Boomerang took a sample of 200 holiday deals on popular sites such as Walmart, Target, GameStop and Best Buy and found these same items were priced as cheaply or cheaper on Amazon. But this “strategy” is not just a one-time occurrence during the holiday season. It is a constant battle throughout the year. Markdowns are at their worst levels ever and are especially high when they are a last-ditch effort to get rid of “dogs” – those items that didn’t fit the desires or needs of consumers. Maybe the retailer didn’t have the right sizes or colors. Or perhaps another hot product came along and demand shifted to that product. If merchandising mistakes are kept to a minimum, the effect of moving the excess inventory created by the dogs is minimized. But if too many mistakes are made, deeper markdowns to move higher quantities of undesirable merchandise will cut very deeply into the profits of the retailer. In addition to using markdowns to beat the competition and to sell slow-moving inventory, retailers have conditioned customers to expect discounts. A January 2017 report by NRF found that one in three shoppers said that 100% of their gift purchases for holiday 2016 were on sale. Another studywe performed in conjunction with Li & Fung found that on average, consumers are willing to pay only 76% of asking price across a number of women’s wear product categories. We also reported that 45% of women had to see a discount of at least 41% to consider entering a store. Retailers tend to bring in merchandise that has a high initial markup with the plan of offering big markdowns, hoping that sales at the initial price will cover any future markdowns. But when loyal customers see the deep markdowns, they begin to wonder just how much the merchandise is really worth. New customers begin to shop there based solely on bottom-line pricing and the store brand suffers, while loyal customers start looking elsewhere because the competition has not gone away. However, while product and pricing challenges are an ongoing challenge for retailers, there are solutions that can help. 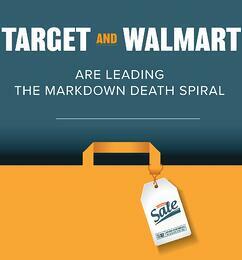 Here are a few ways retailers can help stop the markdown death spiral. Take advantage of your data: Reducing markdowns through getting the product and price right starts with involving customers in merchandising decisions. Combining this customer data with merchant expertise enables retailers to make the most accurate decisions on pricing, products and more. Luckily, consumers do most of the work by telling us exactly what they want -- retailers just need to listen. This customer insight is incredibly valuable in helping retailers to pick the winners vs. the losers from a product perspective. Honor your brand integrity: Price consistency and brand value play a critical role in maintaining customer loyalty. Customers are trained depending on how retailers treat their brands. If you constantly mark down your products to promotional prices, your products and your brand won’t be viewed as valuable. Our recent markdowns study echoes this – we found that switching up pricing models across store locations can have a major impact on customer loyalty, as 69 percent of consumers think retailers should offer the same product pricing no matter where they’re selling it. This new markdowns-focused mindset is hurting the retail industry at large. It’s time for retailers to deal with this problem once and for all and stop relying on markdowns to solve their problems. Instead, they must re-examine their product and pricing strategies and invest in incorporating the voice of their consumers to determine what it is that they value most.